Or, I could use them to create a few blog posts. I have been wanting to write about the enneagram, but starting has seemed intimidating. Where to start? Well, how about my training notes? Response papers, minute essays, return demonstration. All methods I have used to help other people teach adults. Yet it never occurred to me to use them myself. It took Veronica Beaty sharing her learning process on her blog to make me remember what I already knew how to do. Before we start, please take a moment to peruse my disclaimer. Simply put, the enneagram is a personality typing system. 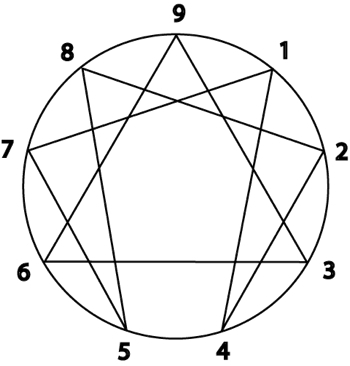 The enneagram describes nine possible personality types. These types are laid out on a circle with nine points, connected by a lines. But it can go beyond just describing people’s types. It can help you see what drives you and your choices and behavior. Each type comes with very different habits and assumptions that lead to the inevitable traps, mistakes and problems. They also lead to gifts and strengths that are unique to each type. The enneagram assumes that we all started in an original state of perfection. Life was easy. We were cared for and didn’t need to work for what we needed to survive. Call it Eden. Call it the womb. Then something happened. Maybe it was a childhood trauma. Maybe it was something perfectly normal that seemed like trauma to a baby or young child. Suddenly that perfect, whole child needed to do something (or not do something) to get its needs met. Maybe it needed to fight, or be very good, or be extra helpful, or disappear into the background. The child loses connection with some aspect of the original state; this loss forms the basic proposition of that child’s life. Most enneagram teachers do not address the nature vs. nurture question; they choose to focus on where we are in the here and now. Here’s one of the places I find myself running into language problems. There are many different words and phrases to describe what the enneagram calls the “basic proposition” yet it is the key to the enneagram. Each type has a different basic proposition; it drives us and determines some of our most basic personality traits, where we get hung up, where our buttons are, what makes us defensive and reactive. Different authors use different words to describe the basic proposition. While more colorful than “basic proposition” they are loaded. Sin. Addiction. Fixation. I like to think of the basic proposition as the lens through which we see and interpret reality. As an example of what a basic proposition, let me share the one for my type, type six. Each type is identified by a number and a number of different names, again, depending on the author or teacher you are learning from. My favorite name for sixes is Loyal Skeptic. Loyal Skeptics have lost touch with the original state of faith –in self, others and the universe at large. They see the world as dangerous and untrustworthy. They seek certainty and safety in either avoiding or facing “danger.” That sentence seems so obvious now that I read it. Certainly everyone either avoids or faces danger, right? This is where those more colorful words come in handy. Fear is my addiction. It factors into everything I do. It is never far from my mind. It is the coin of my realm. Can I trust this person? Will I be safe in this situation? Did the house burn down while I was gone? At times I can – now that I am developing my self-observation practice – feel myself shifting from that worry to this. Telling myself this bad thing will not happen only makes me shift to worrying about something else. Loyal Skeptics don’t trust that we can rely on ourselves. Sometimes we become over attached to authority figures or groups or belief systems, hoping to find security there. Sometimes we reject the very thing we clung to. We can be doubting, accusatory and catastrophizing. We can take forever and a frickin’ day to come to a decision. When we are healthy, we can be extremely courageous; we have so much practice overcoming fear. We are great planners; we can see all the things that can go wrong and find ways to avoid or prepare for problems. We are able, as the name implies, to question and still be very loyal. “Typing” is the process by which you determine your type. You can start with an online test or reading a book or even talking with a trained teacher or *cough* someone who might be in the training process. But these are just starting points. The real enneagram magic happens through self-observation. The enneagram is really about what drives and motivates you. Others can guess at that, and they might be good guesses. But only you know for sure – and you might not even be sure. Enter self-observation. Take a test. Make a guess. Then just watch yourself. Does that type make sense? Does it feel like how things are working inside your brain? When people read a book to find their type I tell them they will recognize themselves a bit in each type. We all have a bit of each type because we were once whole and we have that wholeness in us still. But when you read a description that makes you laugh out loud with recognition and then you are shocked that someone knows that deep dark secret you have been carrying and then something else makes you tear up – then you have found your type. “Typing gives us the fuel to do our development work.” That’s what I wrote the first day of my training. Even once you have found your type through reading and observation, it’s just the beginning. Once you start observing and working with your type, you start to see the box you live in. You see the habits and assumptions you use to run your life. You can expand the space – even if only for a few seconds – between your buttons getting pushed and your reaction taking place. And in that space is freedom. This entry was tagged Blogging, Enneagram. Bookmark the permalink.